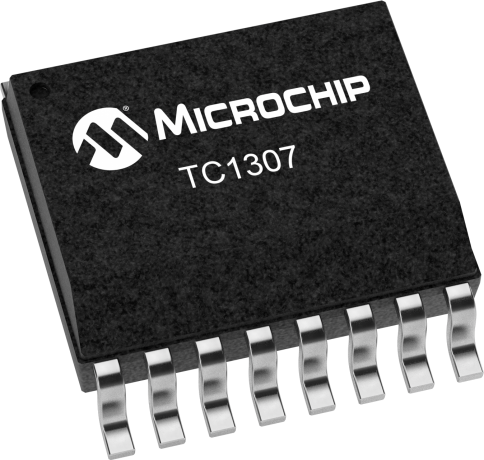 The TC1307 combines four CMOS Low Dropout Regulators and a Microprocessor Monitor in a space-saving 16-Pin QSOP package. Designed specifically for battery-operated systems, the device’s CMOS construction eliminates wasted ground current, significantly extending battery life. Total supply current for this device is typically 220µA at full load on all four LDO channels. The TC1307 features selectable output voltages for higher design flexibility. The SELECT Mode pins allows the user to select from 4 different values (1.8V, 2.5V, 2.8V and 3.0V). An active low RESET is asserted when the output voltage VOUT2 falls below the 2.63V reset voltage threshold. Other key features for the device include ultra low-noise operation, fast response to step changes in load, and very low dropout voltage, typically 165mV at full load. The device also incorporates both over-temperature and over-current protection. Each regulator is stable with an output capacitor of only 1µF and has a maximum output current of 150mA.